Ron Greygoose tells the story of the Marconi Sailing Club history. Stansgate is located at a strategic position on the Blackwater Estuary opposite the eastern end of Osea Island, which was used as a secret naval base during WW1. The launching Hard and the gun emplacement, on which the Race Box stands, are indicators of its importance during two world wars. 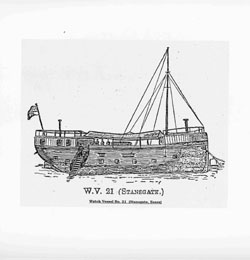 During the 19th Century Watch Vessel No. 21 (Stansgate, Essex) was permanently moored high up near the old Clubhouse and used by the Coast Guard to supervise all craft using the river. 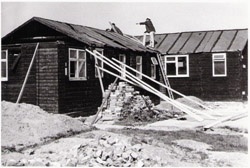 The white hut, complete with brick built chimney, is one of three wash houses built for the officers’ families to use. Just prior to WW2 the Stansgate site was advertised as ‘Stansgate Abbey Beach’ with a Guest House and extensive camping and boating facilities at Ramsay Wick. In the early sixties there was a move to breach the seawall and build a marina in Ramsay Wick, but this failed and the area is now protected against any such development. The formation of a sailing club for employees of Marconi’s Wireless Telegraph Company Limited was first mooted in 1950. 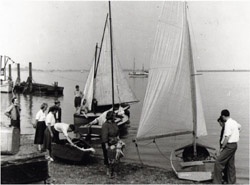 A group of yachting and boating enthusiasts, some of whom were members of local sailing clubs, began a series of informal meetings, often in working hours. Some were keen to form a club on the River Crouch at Burnham, but this fell out of favour due to the strong tidal conditions and the distance from Chelmsford. An extensive search was then made to find a more suitable location. The club was formally established in March 1952 as the ‘Sailing Section’ of the Marconi Athletic and Social Club (MASC), under the chairmanship of Terry Hallam, the first official commodore. The names on the Honours Board for the years 1950 and 1951 are the names of the leading protagonists during those formative years, as seen by Eric Payne who donated the Honours Board some years later. The following month saw the May and Butcher 60` x 18` Boat Shed on the seawall at Heybridge Basin become the club headquarters at a rent of £50 per annum, including electricity. The first class to be adopted was the Fleetwind and some twelve were built by members. These were stored in racks in the shed together with an assortment of other boats. The problem of removing them, lowering them down the seawall and stepping masts for every event is proof of the enthusiasm of those early members. 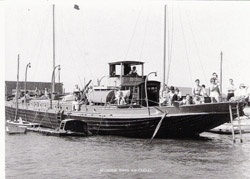 In 1958 the 97′ motor yacht ‘Mamgu’, originally conceived as the working barge ‘Cawana’, was acquired by the club from a Mr Crawshay who had used her as a permanent home for many years at Maldon. She was towed round to Heybridge Basin by Water Bailiff, Cecil Stebbens and moored bows-on to the seawall. 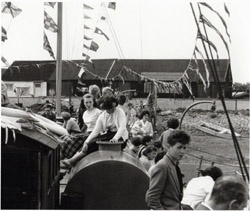 The lease on the shed was given up now that the club now had its own proper clubhouse, and some ground suitable for dinghy storage was rented from local allotment holders. It soon became apparent that the club would need to find an alternative site onshore in order to secure its long-term future. Possible sites were found at Stansgate and Maldon, and in March 1963 a 3-year lease, later extended, was secured on the small strip of land at Stansgate now used as the cruiser park. 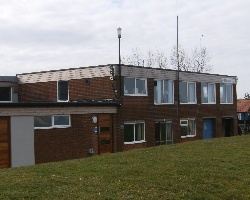 Timber offices in Braintree were purchased, dismantled and re-erected as a ‘temporary’ clubhouse to the east of the floodgate. Mamgu was sold to the Education Authority of the Borough of Westham, for use as an Outdoor Activities Centre. The ‘Stansgate Marina’ project eventually failed and negotiations were begun to secure the club’s tenure of the Stansgate site. In October 1971 the MASC purchased the site as we know it today. Building of the present-day clubhouse was completed in July 1974. The old timber clubhouse was purchased by Sandon Sports Club and remains in use to this day. 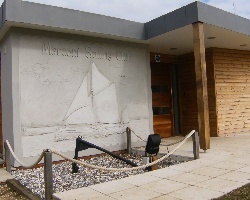 Finally in September 2003 the members of the sailing section purchased the site and assets from the MASC, and after consultation decided to retain the name ‘Marconi Sailing Club’. The club is now fully independent and welcomes members with or without a Marconi connection. One of the benefits of Marconi becoming a separate entity is the freedom it allows its members to make their own decisions about how the club is run. One of the main priorities was to address the club’s changing facilities and entrance hall. During the winter of the 2008-2009 season building work commenced on the club’s extension with club members helping to demolish the existing changing rooms and interior walls. Building work was finally completed just in time for the 2009 season; modern equally sized changing rooms with individual shower cubicles replaced the former communal shower areas including dedicated disabled changing facilities, an external washing up area for the summer months and a bright and airy entrance hall completed the build. A nod to the club’s original clubhouse was given in the form of a bespoke scale model of “Mamgu” – Marconi Sailing Club’s original clubhouse which is located in a dedicated glass cabinet in the entrance hall. The exterior of the building is finished in contemporary wood cladding and the focal point for the entrance to the clubhouse is a specially commissioned stone mural depicting a Thames Barge – a frequent sight along the River Blackwater. Through the dedication of its members the club is constantly expanding with the recent completion of the pontoon and re-location and construction of the tractor shed. Watch Vessel 21 (Stansgate, Essex) A print of this still hangs on the clubhouse wall in the upstairs saloon. 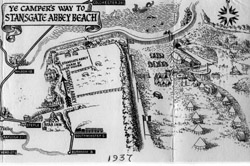 Stansgate Abbey Beach – even then a developer’s dream! !